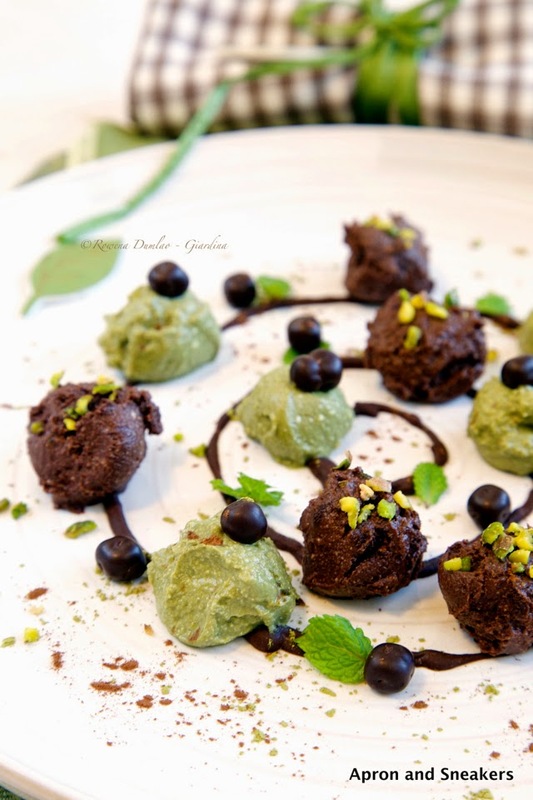 I have already prepared this dessert a few times with delicious results and guess what? It is so simple to prepare. Ricotta is always so versatile. It goes well either with salty or sweet dishes. Treat this recipe like an emergency dessert that you can whip up quickly and easily then let your creativity take over you. I served this once in mono-portions in a small glasses, once divided vertically and another time divided horizontally like a trifle. 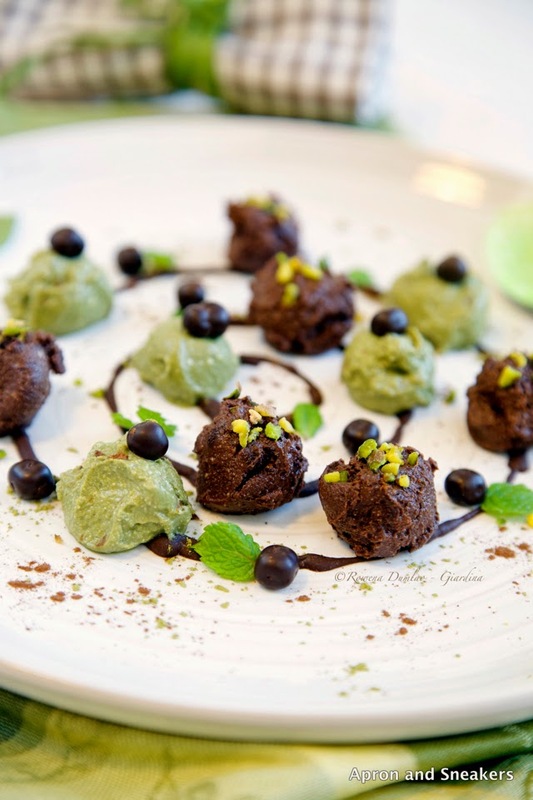 The brown and green contrast of the chocolate & Matcha green tea gives this plate a visual enjoyment of what you are about to be treated to. Having a problem with the milky tastes of fresh cheese, I am always cautious about eating ricotta. With these mixtures, I don't taste anything disagreeably milky, just strong chocolate and green tea flavors. And did I say that they are absolutely delicious too? I think I already did! Enjoy and have a good weekend everyone! Divide the ricotta equally to two small bowls, 100 grams each. In one bowl of ricotta, mix in the cocoa powder and 50 grams of icing sugar. Cover with a plastic wrap and refrigerate for an hour. 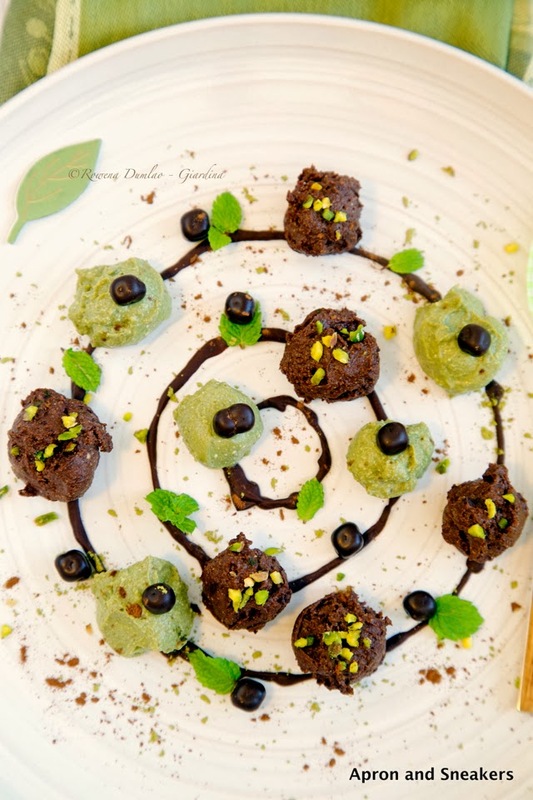 In the other bowl of ricotta, mix in the green tea powder and the remaining 25 grams of icing sugar. Cover with a plastic wrap and refrigerate for an hour. Melt the chocolate in a bain marie or water bath (or even microwave, just watch out that it doesn't burn) with a little bit of water. When it has completely melted, put it in a container with a nozzle for decorating or use a teaspoon to make the circles on the plate. Using 2 teaspoons (in my case, I used a melon baller and a teaspoon), make the balls by passing a dollop of the ricotta from one teaspoon to the other to shape it. Put the balls on the chocolate circles on the plate. 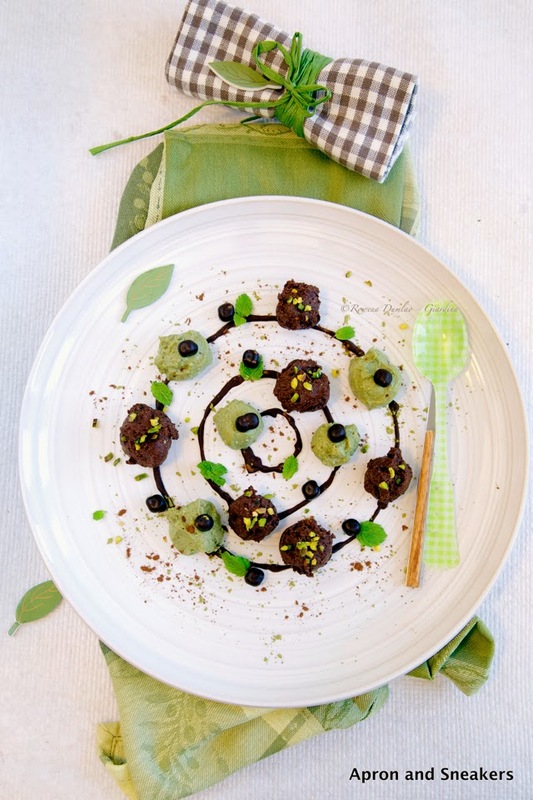 Garnish the plate with pistachios, mint and chocolate balls.